OMEGA is an industrial sensor and measurement solutions provider with over 50 years of experience. With the ability to provide a complete range of instruments and engineering services, OMEGA is an ideal partner for the automotive industry. 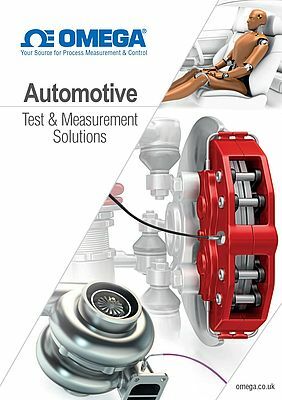 OMEGA's comprehensive range of sensors and measuring instruments is utilized every single day in countless automotive applications around the world. Moreover, the company provides a complete service throughout the automotive value chain with teams of specialist engineers ready to assist at a moment's notice to improve the performance and efficiency of your processes and applications. OMEGA is specialized in the following areas: research and development (R&D); bodyworks and car assemblies; powertrain and engine testing; safety testing; infrastructure monitoring. Both car manufacturers and subcontractors are supported with standard and tailor-made custom solutions. By the ability to address specific testing needs, OMEGA can provide cost-effective, accurate measurement systems that can meet the highest requirements for reliability and longevity. It can also supply more than 100.000 different standard products including custom probes, specific thermocouple wires, pressure transducers and a wide range of temperature measurement equipment.